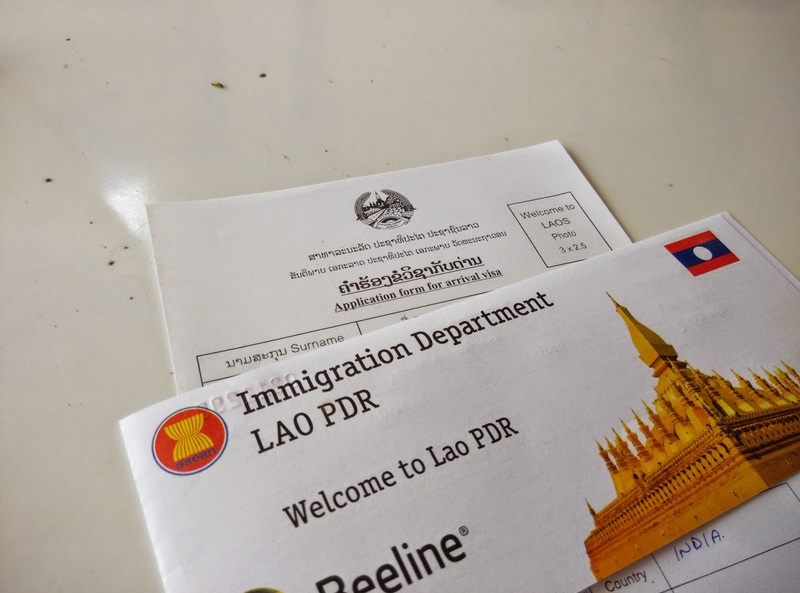 After 4 months of planning that involved several email conversations and meetups, we finally completed our two nation trip covering Thailand and Laos. During my engineering days, I used to check for long weekends and linking holidays so that I could take a long vacation and go home. I still do that and I observed that taking a 3 day leave can get me a 9 day vacation. But since I stay with family now, I could travel elsewhere in those 9 days. So 3 of us discussed about it and Vikram pointed to us that we could go on a Thailand and Laos trip. His friend had planned the trip but did not go on the trip. We agreed upon it and applied for leaves in office. We booked flight tickets 3 months before the trip date because the tickets were cheap then. We booked beds in backpackers hostel dorm and also applied for a Thailand visa. Visa on arrival was available, but we did not want to waste time (we ended up wasting a lot of time during the trip anyways). 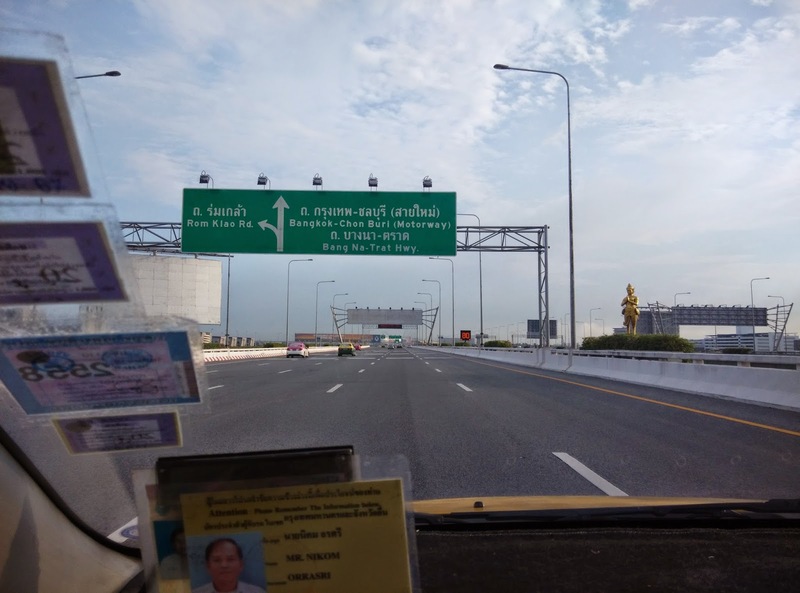 I came home early from office on Friday (the day were we supposed to leave) and took a Vayu Vajra bus to get to the airport. Amruth and Vikram joined me there. The flight was scheduled to depart at 00:30am. We all had a backpack each (bought it especially for the trip along with some new pair of clothes) and we checked it in. So we just had our passport and boarding pass to carry in the flight. Vikram was carrying the book ‘Yaana’ which was suited for the occasion as we were taking a Vimanayaana. 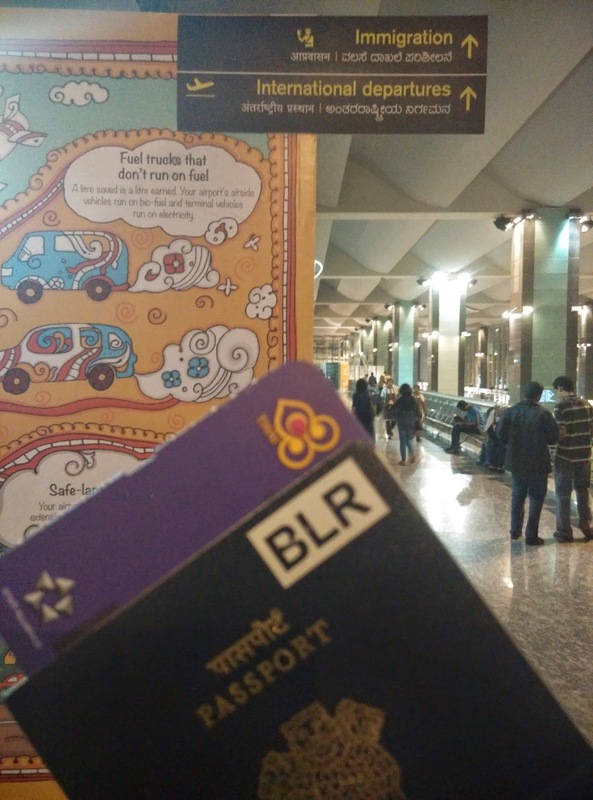 The immigration officer in the Bangalore Airport pointed out that in his 7 years of service, he did not see anyone carrying a Kannada book. It was a 3.5hrs flight and we landed in Bangkok Airport at 6am local time. We did not have a room reservation for this day, so we freshened up in the airport restroom. I was reminded of the movie terminal. We had to book train tickets to Laos, so we took a taxi to the railway station and after booking tickets we dumped our bags in the luggage room. 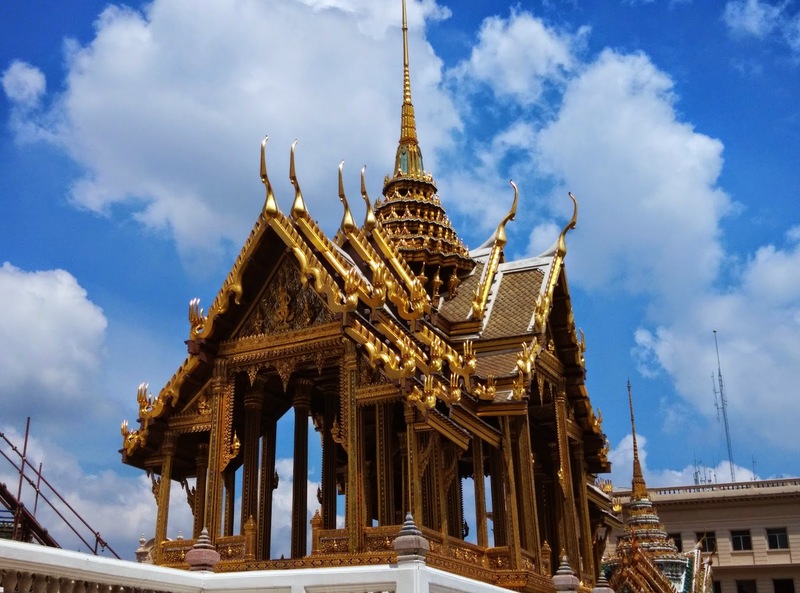 As per our plan, day 1 was covering all tourist destinations in Bangkok. After speaking with the help desk, we took a bus to our destination. 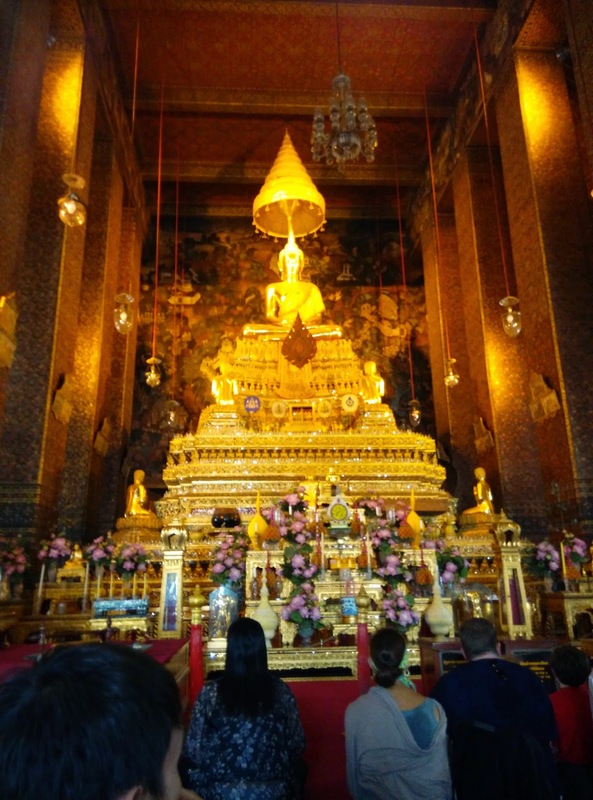 We covered The Grand Palace, Reclining Buddha and Wat Arun. We felt an overdose of Buddha statues by the time we reached Wat Arun. And every place had a hefty entry fees (100 bahts to 500 bahts). We also got caught in the boat ride scam. We were promised a boat ride covering floating markets and other places on the river bank but we just got a 45mins boat trip with nothing significant to watch. We walked between all these places and took the bus back to railway station. Communicating with the conductor was a pain. No one understands English and they talk amongst themselves, which looked like making fun of us foreigners (If you are a north Indian in Bangalore you could probably relate wrt to bmtc and autos). We then walked to Chinatown as we had time to spend. At 7pm the Laos national anthem was played in the railway station. Was kind of nice, we also should play our national anthem once a day in public places. Our sleeper train left at 8pm to Nong Khai, the border town of Thailand. It was a 10 coach train and it had one railway helper in each coach. The train was super clean and the helper brought fresh sheets and made sure your sleeper berth is comfortable. But yes, the toilets were like in Indian railways. We dumped our bags in hostel and set out for the day. An interesting thing happened here. We had forgotten to convert dollars to local currency and the entry fees had to be paid in local currency. It was a Sunday, so most places were closed. Luckily for us the super markets accept dollars or Thai bahts and give change in kips (local currency). We bought 3 drinks here just so that we could get the local currency. 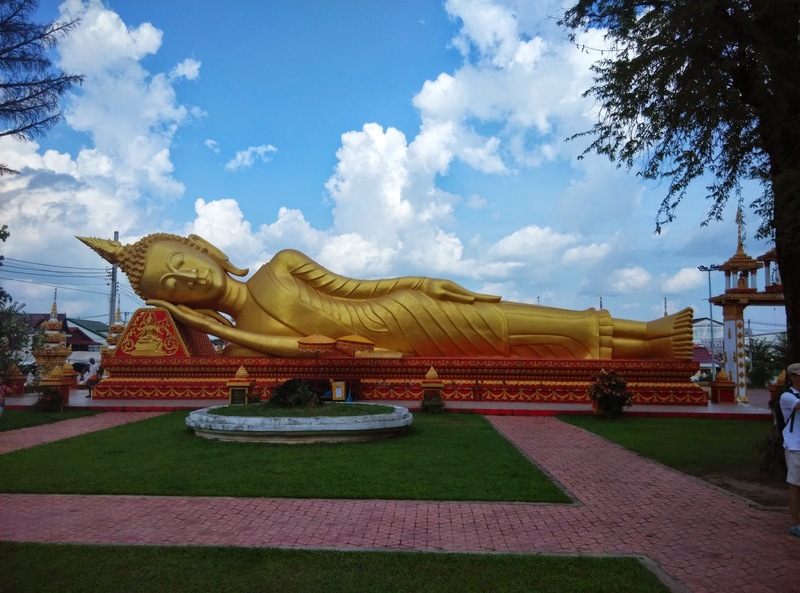 After wasting an hour to get the currency we finally managed to see the first Buddha statue in Laos :P We visited Pha-that-luang, the great stupa of Laos and then walked to Wat-Si-Saket and Patuxai park. We also walked past the morning market and the presidential palace. We came back to the hostel after walking for over 6kms. 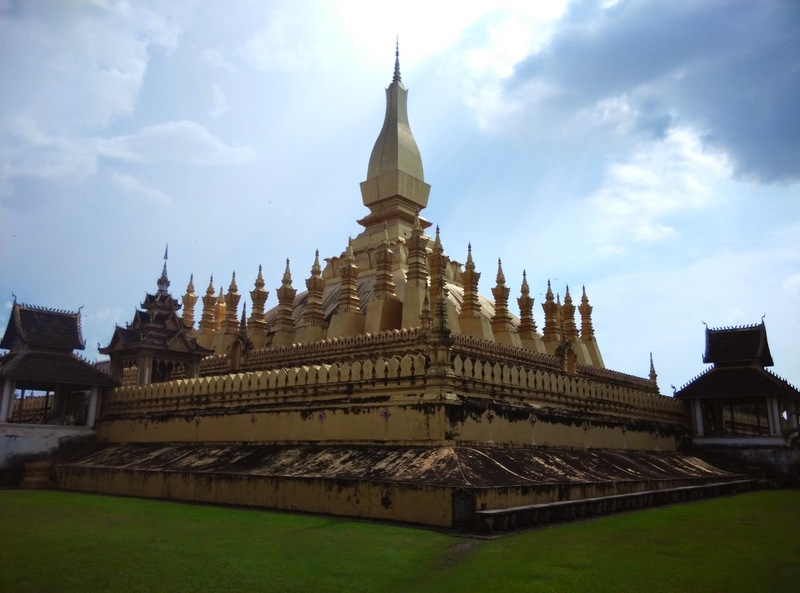 If we had walked 4 more kms, we would have circled the entire city walking (Ya, thats the capital of Laos). Back in hostel we met our roommates. The guys in our dorm were from Netherlands and Australia, the girls were from London and Germany (yes, mixed dorms). 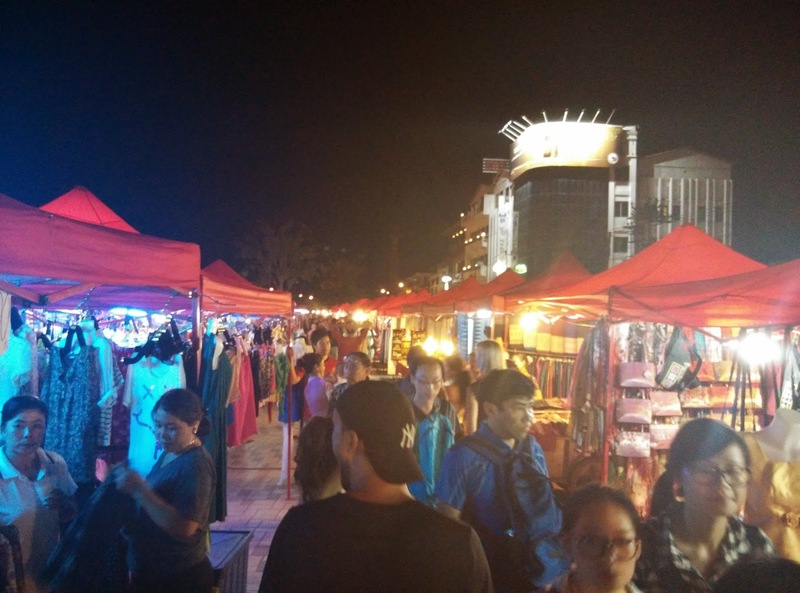 All of us set out to explore the night market and we taught them a bit of bargaining (apparently my crappy bargaining skills seemed awesome to them). We ended the day with some nice drinks at a Belgian Bar. Here we talked for over 2hrs about what each of us did for a living. It was inspiring to see the amount of freedom these people had to pursue their dreams. As we checked out of the dorm next morning, Vikram wrote “ಎಲ್ಲರೊಳಗೊಂದಾಗು – ಮಂಕುತಿಮ್ಮ” on the graffiti wall of the hostel, which translates to “Be one among everybody” (i would say thought provoking).